The Egyptian government did not maintain or needed any gold treasury, civil servants were paid in food and gifts, money did not exist until the Ptolemaic Period. 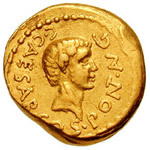 The general population did not use any gold in their daily life, and the metal had no economic importance for them. J. T. McGee has urged me not to believe everything I read on the Internet, and so I’d better verify the above claims. The first text that I read that would suggest that money existed in Egypt is Genesis 47:14 (RSV): “And Joseph gathered up all the money that was found in the land of Egypt and in the land of Canaan, for the grain which they bought; and Joseph brought the money into Pharaoh’s house.” The term for money is keseph (כֶּסֶף), silver, and many ancient Near Eastern texts refer to the monetary use of silver, often measured in shekels–though apparently this was before the invention of coins. So money existed in Egypt at the time of Joseph many hundreds of years before the Ptolemaic period. For those skeptical of the historic worth of Genesis, in The Journey of Wen-Amon to Phoenicia (J. B. Pritchard, Ancient Near Eastern Texts (ANET), 25-29), a text dating to the 11th century BC, Wen-Amon travels from Egypt to Phoenicia to buy timber, but has his gold and silver stolen while harbored at Dor to buy provisions. So clearly, silver and gold had already become money in international trade. In The Expulsion of the Hyksos (ANET 233-234; 15th cent. BC) , a relatively common ship’s captain recounts his military exploits for which he received on seven occasions a reward of gold. It would appear from these texts that gold was monetized in ancient Egypt, in the sense that it served as: (1) payment; (2) intermediary of trade; (3) store of value.